Simon Johnson is the data recovery practice lead at GlassHouse Technologies (UK) Ltd., where he brings over 10 years of data protection, consolidation and transformation experience. During his time at GlassHouse, Simon has worked across all industry verticals delivering projects that focus on transforming the protection of data into a business value aligned service. DR is a crucial component of any business, so it’s essential that delegates understand the implications of not having a strong DR plan in place. Having a comprehensive DR plan in can really impact profitability; without it businesses are risking everything. The moment a company experiences downtime they begin to lose money. If they’re unable to recover quickly, the downtime dramatically impacts profitability and in many cases businesses don’t recover at all. The time taken to move from a ‘down’ business to a running business again, can also impact reputation and customer trust. In this session, Simon Johnson, Glasshouse Technologies (UK) data recovery practice lead, will provide delegates with the knowledge they need to protect their businesses. Today's businesses require very sophisticated storage management capabilities to fully protect critical business information and keep it highly available and readily recoverable. While many IT professionals are aware of the consequences a disaster can have on their critical infrastructure and overall business, some continue to delay creating a disaster recovery plan. 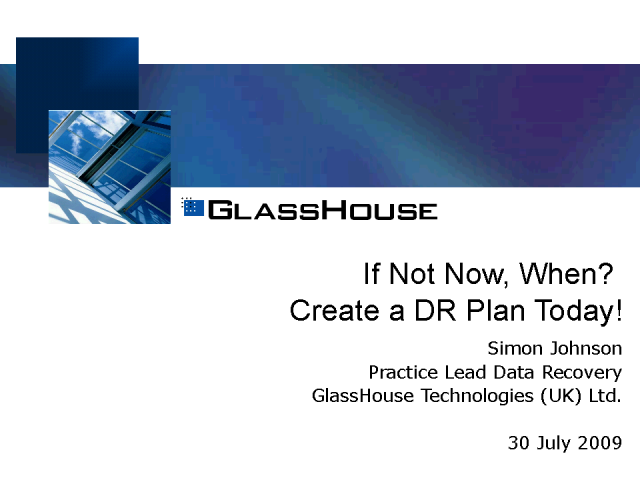 Simon will also address the reasons some IT professionals are failing to implement practical DR plans and offers some best practice tips to successfully design a DR strategy, including the tools and policies that should be included a DR plan if they already aren’t. Additionally, the session will highlight financial and organisational impact of DR without a plan.